We do not accept children under the age of 12. The hotel is not child-friendly as we do not have a lifeguard on duty, steep staircases, etc. Swell reserves the right to cancel a reservation and refuse a guest at their own discretion, unilaterally and for any reason. Check In time is no later than 10:00pm. Any check In past 10:00pm without notification from the guest will be refused. Please note that there are no ATM’s in town, so it’s important that you withdraw cash before you arrive in El Paredon! We accept payment in Cash (GTQ, USD, CAD, or EUR) or Credit Card. For all Payments handled by Credit Card, a 7% Transaction fee will be added to the total. 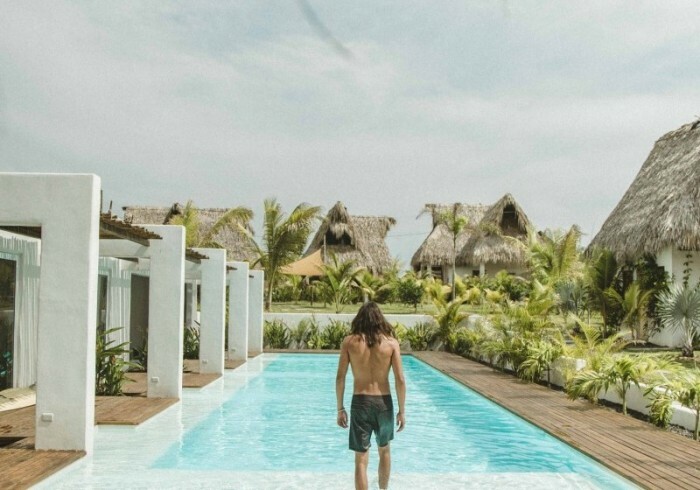 SWELL IS A SURF & LIFESTYLE HOTEL - WITH A LAIDBACK SPIRIT; LOCATED ON THE BEAUTIFUL AND UNTOUCHED VOLCANIC BLACK-SAND BEACH OF EL PAREDON, GUATEMALA. SWELL OFFERS A RUSTIC, YET ELEGANT AND COZY BAREFOOT BOHO-CHIC ATMOSPHERE FOR TRAVELLERS TO GATHER, KICK BACK AND SHARE IN OUR SMALL PIECE OF PARADISE. EL PAREDON'S REPUTATION AS A SURF DESTINATION IS GROWING - AND FOR GOOD REASON. WHETHER YOU'RE A BEGINNER TO SURFING, AN EXPERT, OR NEVER SURFED A DAY IN YOUR LIFE; WE'RE CONFIDENT THAT YOU'LL LOVE EL PAREDON'S UNCROWDED WAVES AND ALL AROUND GOOD VIBES.